Providing exceptional strength and extreme resistance to environmental influences such as fire or pests, steel stud framing is increasingly becoming a more popular and sensible alternative to wood frame construction. 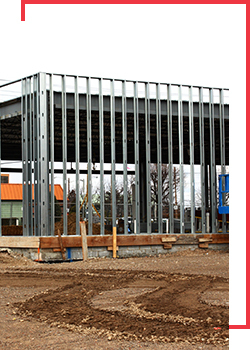 As professional home builders in Northern Colorado, we prefer to use steel stud framing in all of our home remodeling and tenant-build construction projects. We believe using premium building materials, such as high-grade steel studs ensures unparalleled, long-term structural integrity. With the highest strength-to-weight ratio of any framing material, steel studs create straighter walls and tighter corners, making your home or building less vulnerable to environmental issues that prove deleterious to its structural integrity over the years. With more than a quarter-century of construction and remodeling experience under our tool belts, we have the experience, knowledge, and skills needed to ensure superior construction with every project. Our goal, before we ever pick up a tool, is to complete the job right, the first time, without exception or compromise. We simply aren’t happy with any project until you are happy. Find out why so many of your friends and neighbors choose Diversified Construction Services for their residential or commercial build projects by scheduling your free estimate now.